Humanity has in the millions of years after inevitable holocaust and exile transmogrified into a race of not-quite-human seals on Darwin's Galapagos Islands. Leon Trotsky Trout, the son of Vonnegut's wretched familiar character Kilgore Trout, watches and broods over his no-longer-human descendants who have made natural selection a matter of debased survivalism. Using a device common in his novels after Slaughterhouse-Five, the material is presented in the form of a transcript or memoir; Trout unhappily witnesses a sad outcome which may nonetheless represent the best of all human possibilities. Trout's father Kilgore, in ghostly form, remains in communication, urging his son to cease observing and exit, but Leon will not take the opportunity, feeling linked to the pathetic, morphed shards of humanity who remain on the Islands. Whether the survival of the seals constitutes human survival, whether Kilgore and his son are imaginary fragments of evolutionary decay lurk as questions beneath a sequence of events which show Vonnegut trapped in the Age of Reagan. 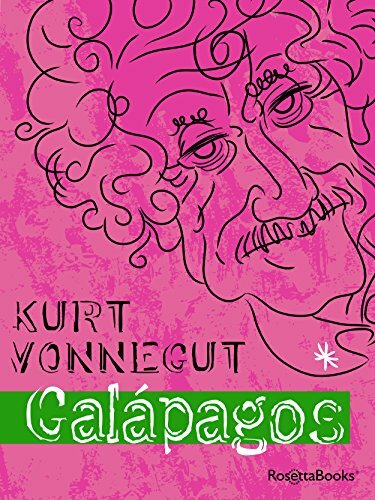 Vonnegut is trying to see through (rather than to shape) his material; the theme of the novel represents a kind of apotheosis and never has Vonnegut's ambiguous despair been more clearly revealed or more clearly made the engine of his narrative. nicolas cage (Grade: A–) upon completion of this book, i howled at the moon, three or four times.